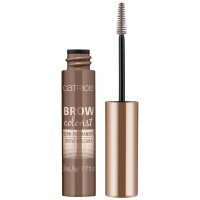 Brow Colorist Semi-Permament Brow Mascara by Catrice. It tames all unruly hair while giving them color. It has a small, comfortable brush, ensuring smooth and problem-free application. Enriched with thickening micro-fabric, it fills all gaps. It makes the eyebrows more dense and expressive. With regular use, the natural color of the hair gradually increased. The product is available in 2 shades. It tames eyebrows and adds them color. It provides efficient and comfortable application. With regular use, it gradually intensified the natural color of hairs.